An open source project at Michigan Technological University can turn waste plastic into high-quality 3D printing filament. 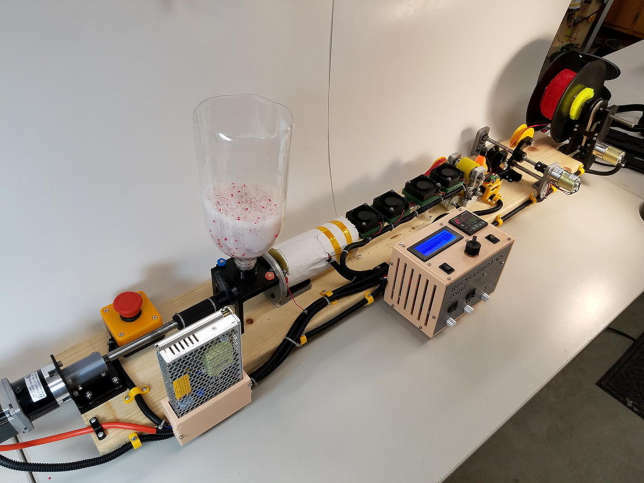 "RepRapable," as it's called, was designed and built by three students and one professor in the Department of Mechanical Engineering-Engineering Mechanics. The plans were made available last year under a Creative Commons license in the journal HardwareX. RepRapable isn't a new idea. Open source and commercial versions of "recyclebots" exist aplenty, according to the plans. But as the project authors noted, building or buying these systems ranges "from $6,000 to tens of thousands of dollars." RepRapable costs about $700 for the components and takes about 24 hours to build. According to its makers, the machine can replace the filament made by commercial pellets for roughly 22 percent of the cost and cut the amount of energy used in creating new filament by about 90 percent. It can also fabricate the recycled waste plastic into filament for 2.5 cents per kilogram, about a thousand times less than the cost of commercial filament. The name comes from the term adopted by the 3D printer community to describe a replicating rapid-prototyper ("RepRap") that can print its own components to recreate itself. In this project, the recyclebot can generate the filament needed to replicate itself on any RepRap 3D printer. The plans include a detailed materials list, step-by-step build and operation instructions, assembly photographs and illustrations and a link to a source file repository, maintained on Open Science Framework. A link to the article itself is available on the Michigan Tech website.